Events venue Woburn House in central London has undergone a £2m update and refurbishment. The venue, which is situated by Euston Station, has seen all eight of its versatile events spaces restyled and fitted with up-to-date AV systems. It has also introduced a new catering company and extended its opening hours. 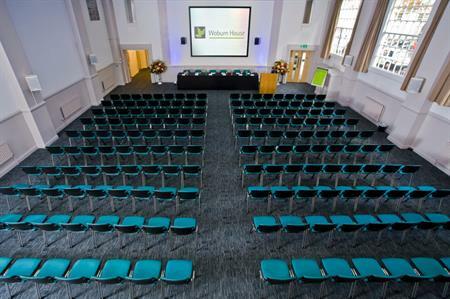 Woburn House can now be hired exclusively during evenings and weekends, with an extended capacity of up to 500 delegates across all rooms. It is also offering new day delegate rates. The most striking renovation is in the Main Hall, which now features professional stage lighting and colour changing lighting that can fit with corporate brand colours. The venue also features a well-lit foyer space that can be used for breaks and drinks receptions. Richard Bull, general manager at Woburn House Conference Centre, said: "Our unrivalled location in the heart of central London, along with our recent refurbishment, firmly establishes us as one of London’s leading venues. We are extremely proud of all the work that’s been done and it’s far more than just a new look, we are now offering a totally new experience.